The head of the NHS and previous vice president of the largest private healthcare insurer in the U.S. 'Simon Stevens' was accused of abandoning waiting times targets after he said some patients would have to wait longer for treatment. 3.78 million patients are now waiting longer for NHS treatment - a rise of more than 50 per cent since 2012. 1,573 patients are now waiting more than a YEAR for planned operations, compared with 886 just a year ago - a rise of 78 per cent. Over the past three years, the number of patients waiting more than 26 weeks for treatment has increased from 60,402 in April 2014 to 136,030 in April 2017 . Touchscreen advertising within NHS GP practices are now offering patients facing waits of almost a month a same-day appointment for £39. Evidence that the NHS is moving towards a “two-tier” system, where only those who can pay upfront could get the care needed. 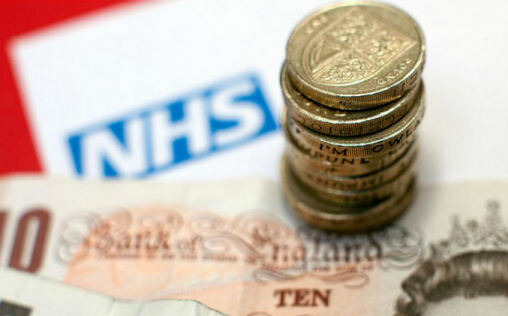 Senior NHS managers have been told to “think the unthinkable” as part of a national programme to cap costs. This 'capped expenditure process' could be seen to be forcing many trusts to bypass public consultation and implement draconian cuts, downgrades, and service contract handovers to the private healthcare sector. Closing wards and surgical theatres, cutting back on staff, and systematically lengthening waiting times for operations are among the moves being discussed between NHS England, health trusts. and some management consultancy firms such as McKinsey and Deloitte. Fourteen areas are under particular pressure to make swingeing cuts because they are on course to miss agreed “overdraft limits” so have been told to follow the capped expenditure process (CEP) . This includes 'Morecambe Bay' which is in the same STP footprint as Chorley & South Ribble. ■ Midlands and Lancashire Commissioning Support Unit (CSU) are working on behalf of Chorley & South Ribble and Greater Preston CCGs and in December 2016 put four more NHS services out to tender to the estimated value of £12,751,970.00 per year. These are: Musculoskeletal [MSK], Physiotherapy, Pain Management and Rheumatology Services. Considering the Lancashire Teaching hospital trusts current deficit the above four services are likely to go to the private sector but as yet the tender is still open. The MSK contract is currently held by Virgin Care so it's unknown if the CCGs are renewing this or holding out for split bids (Lots) along with the other services (Physiotherapy, Pain Management and Rheumatology) . 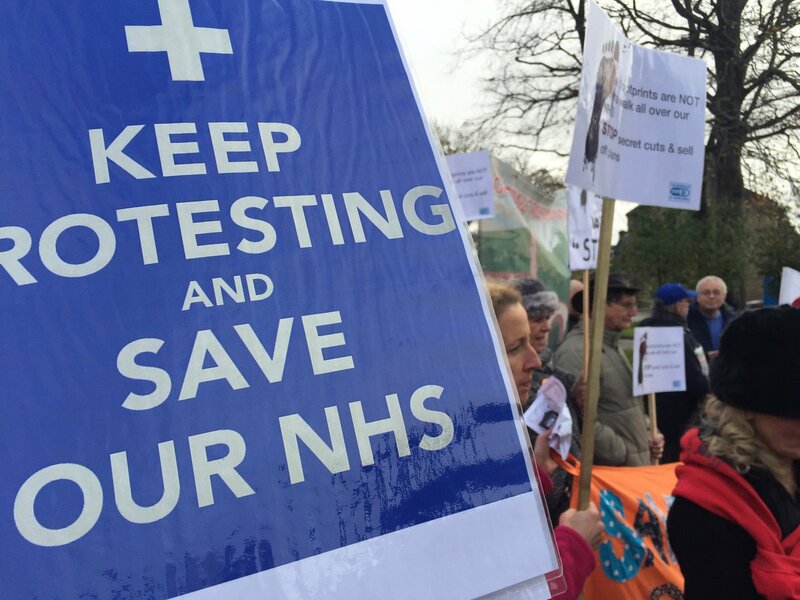 Lancashire County council could be forced to join with private healthcare sector & thousands of lives put at risk if underfunding continues. We're told that the voluntary or third sector play a large part in the STPs with many health and social care services relying on these. Impact - "However the picture and the outlook is not all rosy. Third sector funding investment is falling year on year however demand for service is increasing. 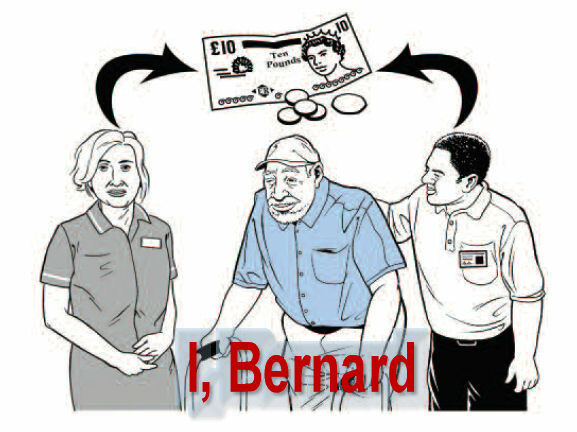 As an example reablement and supported living funding has been dramatically reduced by Lancashire County Council as part of necessary cost savings however many organistions have chosen to continue providing the services transferring the cost onto their own resources. Essentially at a time were prevention is creeping up the [STP] agenda, the actual resources to achieve prevention (public health as an example) are being cut to the bone". it continues.. "The Third sector has become the safety net (food banks and shelters are prime examples) and the economic impact of the lack of funding for those and other services will be further ill-health, increased long term conditions and the requirement for more acute services. The third sector is very aware that it plays a crucial role at both end[s] of [the] scale". Here we are, at a time of high patient demand fighting for more acute services in Chorley and around the country yet the government won't give us back enough money to help us prevent ill-health. The revolution is coming. In fact, the end result of a top-down NHS reorganisation coupled with further austerity cuts to local government will result in many local people being unable to prevent ill-health and symptoms worsening or even leading to death. Yes, the situation is so dire, the STP is actually WARNING the reader that what's to come could result in many many people suffering. ■ ALL STP's are in time to become Accountable Care Organisations (ACOs). These health management models of care are based around the U.S. model of accountable care organisations (ACO) that are infamous for 'managing demand' and further RATIONING treatments and services. Due to its projected deficits, LCC will have no opportunity but to opt into the ACO with other partners bringing about the Private Public Partnership (PPP), and the downfall of a single-tier NHS. *When the LCC merge into the ACO, means-tested care plans (currently under LCCs social care banner) will merge into general health care provision resulting in co-payments and insurance plans as options for standard NHS patients. We now have 'two' options, we can all start looking at where our nearest foodbank is, or we can start to fightback and let those crippling our services know we won't stand for it any longer. By April 2018 the council will not have sufficient financial resources to meet its statutory obligations; even if we don't deliver any of the non-statutory services. The health secretary Jeremy Hunt's visit to Preston Hospital on Tuesday was to promote his version of an English 'Kaiser Permanente' which he believes will solve all financial and clinical problems in the regions. 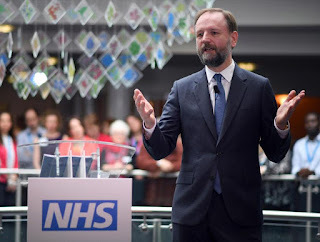 And technically it will, since his and Simon Stevens' Transformation Plans drive all profitable services towards the private sector thus dismantling the NHS and killing off thousands of patients in the process. 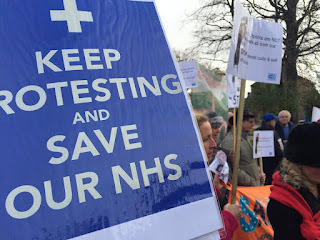 A few of our campaign team were there on Tuesday outside Preston hospital to remind Hunt that our NHS is not for Sale and that we continue to fight for a 'publicly provided' and 'publicly owned' Universal Healthcare System available to everyone, free at the point of need. We've always paid into a publicly provided healthcare system and we will NOT TOLERATE any more interference from politicians who's sole purpose is to transform our health services into profitable ventures just to their suit their own political ends. PAGE 6 of Yesterday's Chorley Guardian highlights the hypocrisy of what's supposed to be a body representing patient's views. Healthwatch Lancashire are supposed to scrutinise and question existing and proposed changes to healthcare in our region. Instead, in response to excessive attendances at Lancashire's hospitals the chairman of Healthwatch Lancashire Mike Wedgeworth claims the 'NHS' is looking to establish new 'urgent treatment centres' open 12 hours a day 7 days a week staffed by GPs with simple diagnostic tests and accessed using the 111 phone line. These 'urgent treatment centres' referred to are private/public partnership clinics run by the likes of Serco and VirginCare and are referenced in all STPs as 'Multi-specialty Community Provider clinics (MCP). Remember - we are already short of hospital staff, GPs, and funding, one reason for more patients attending urgent care/A&E. But... Ironically, the Healthwatch chair then contradicts himself saying..
"it's an ambitious plan, and to be successful it depends on the right staff being available at the right place and at the right time. The fear must be that the increasing shortage of GPs and nurses will frustrate the big hope". So what is this 'big hope' the chairman of Healthwatch Lancashire speaks of? Do Healthwatch Lancashire have an agenda of their own? 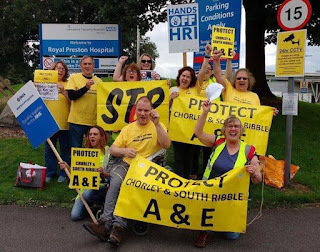 Why aren't they scrutinising the plans to transform healthcare in Lancashire? Where's the money coming from to pay for these clinics on every street corner? Where's the staff coming from to fill all the vacancies? Where's the evidence that these changes will result in better patient care and better outcomes for ALL patients? What effect will this have on destabilising existing hospital and GP services? Will the new models of care be implemented before we see any evidence that they are financially and clinically sustainable? Why are these plans 'ambitious'? Why isn't Healthwatch Lancashire scrutinising these STP plans and reporting back to the public on the feasibility of the plans with any potential risks to patients and to financial stability in the NHS? Because it's likely, just like everyone else, Healthwatch have been kept in the dark about Jeremy Hunt's covert STP plans to dismantle the NHS. Yet the worst thing a Healthwatch body can do is to forge ahead and promote plans that have no evidence-base and jeapordise a publicly run healthcare service putting the quality of patient care at risk. All these questions, and I have yet to see a single valid answer from Healthwatch Lancashire. Take a good look at this man.His name is Simon Stevens, ex policy advisor to Tony Blair. He is responsible for betraying the NHS and is currently the Tories head of NHS England, put there by the disgraced Health Secretary Jeremy Hunt. Stevens is ex vice president of strategy at United Health, the largest private healthcare insurer in the Unites states, where he oversaw 'Medicare', a program that rations healthcare plans to those in receipt of welfare. 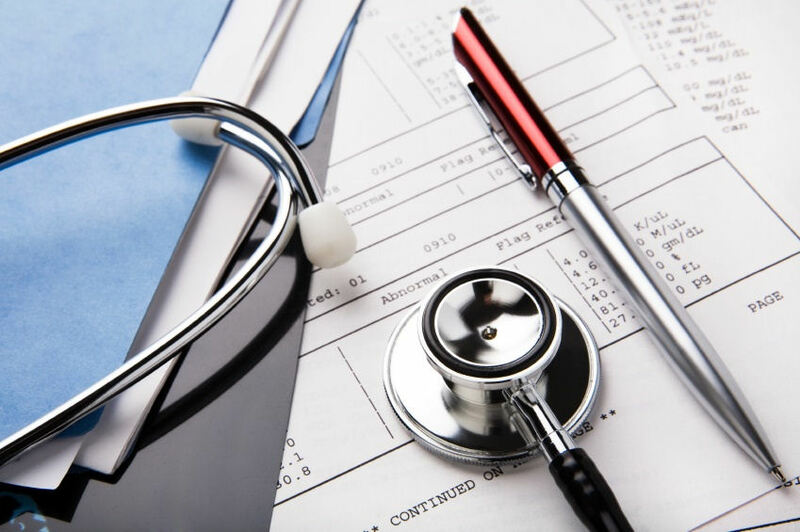 The U.S. were recently rated LAST out of all modernised countries in areas of healthcare such as efficiency, cost-effectiveness, and access for all to healthcare. Yet Stevens has brought his U.S. private health experience with him from across the Atlantic and wants to implement them over here in England. He calls these plans his 'five year forward view', yet they represent nothing more than a transformation of the NHS into the same disastrous healthcare system as that in the U.S.A. Yesterday, Stevens admitted his ruinous plans had resulted in long delays for hospital treatment and that patients should get used to even longer days in the years to come. Stevens was referring to a recent report that claimed thousands of patients were 'highly likely' to have suffered clinical harm after Portsmouth Hospital failed to push for check-ups. Yes, Simon Stevens is Mr STP himself. An ex councillor and hospital porter, this man, along with others such as Jeremy Hunt, are hell bent on privatising the most profitable services in the NHS, destabilising what's left, leaving the NHS with nothing more than a tow-tier poor mans system of healthcare. 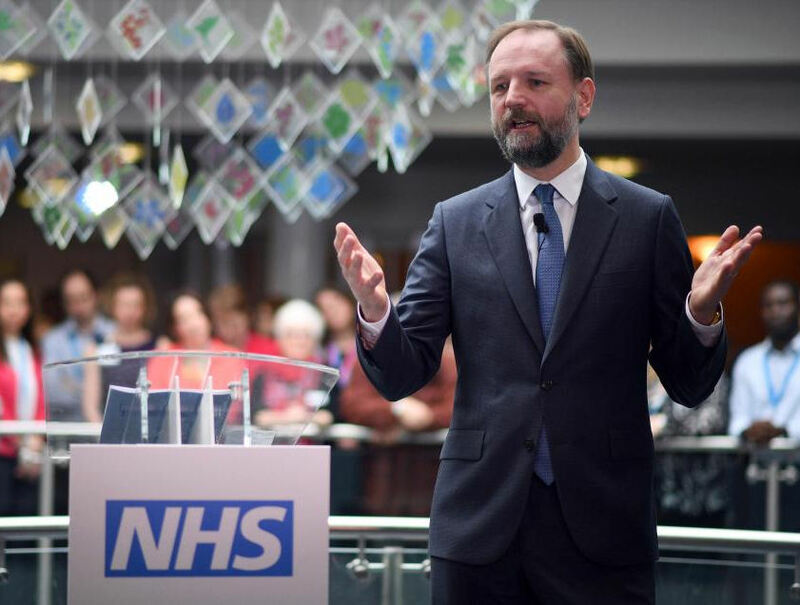 Is Simon Stevens really the right person to run the NHS? City & Hackney Clinical Commissioning Group has finally been the one to state openly that the STP emperor has no clothes – by insisting, with the support of legal advice that STPs lack any legal status or powers to compel CCGs or other “partners” to comply with majority decisions. This potentially throws a spanner in the works of all 44 STPs consolidating themselves as bodies to drive controversial cuts, reconfiguration and service changes. As some campaigners and analysts have argued from the beginning, they have no right to tell any organisation to do anything. And as bodies which function in secret with no transparency or publication of minutes, the STPs lack any legitimacy or public acceptance. Conservative manifesto promises of plans to change the law to allow STPs to take control have had to be scrapped after Theresa May failed to secure a majority. Now the weakness that remains has been powerfully exposed in Hackney, and the door is wide open for campaigners to demand other CCGs and councils take up a similar stance. The CCG has stood out against the plan to merge all 7 NE London CCGs under just one “Accountable Officer” thus minimising – and effectively dodging – any accountability to local people any of the seven NE London boroughs. Hackney council’s Oversight & Scrutiny Committee has endorsed this with a powerful letter insisting on the need to retain the statutory levels of accountability that has remained after the disastrous 2012 Health & Social Care Act scrapped previous bodies and established CCGs. The Health Service Journal publicising the CCG’s stand, the legal advice sent to the CCG and the letter endorsing the CCG’s position and restating clearly the case against local bodies being compelled into collective decisions and losing accountability are all available here. ‘NHS England (NHSE) are determined to roll out country-wide plans for 44 Sustainability and Transformation Partnerships, which will cut £22bn from the NHS budget by 2021 and create Accountable Care Systems (ACSs) which make the NHS more susceptible to takeover by healthcare corporations. NHSE have made it clear that they expect Clinical Commissioning Groups (CCGs) to co-operate with these frightening aims. However City & Hackney CCG are reluctant to hand over responsibility for local decisions about NHS organisation and funding to the ELHCP, based on advice from their lawyers as to the legality of ELHCP’s proposed arrangements. We applaud the fact that Hackney Council is opposing this loss of control over local NHS resources. However NHSE have reacted to this by expressing ‘concern about decision-making processes’ in the CCG, and have hired consultancy firm Deloitte (no doubt at considerable expense) to ‘investigate further’. City & Hackney CCG is one of the most successful CCGs in the country. We are extremely concerned that it is being pressured in this way and that Hackney Council’s right to control local NHS resources is being undermined. We hope that the Hackney Gazette, its readers and local people will give every support to the Council and CCG by emailing their local councillors and/or Mayor Philip Glanville, to confirm they want the CCG and Hackney Council to retain their lawful control over local NHS resources. The private sector has never shown any ambition to take over the whole of the NHS, in the way private capital once coveted British Telecom, British Gas, and other utilities. The reason for this is simple: .. the private sector is profit-hungry but largely risk-averse. Most of the NHS is high risk, and not profitable in its current form. It can only be made attractive to the private sector by paying over the odds for services which the NHS currently provides at lower cost  – and thus inflating costs – or by excluding risk, for example by refusing to cover more complex and costly cases. Private companies want only the sectors of the NHS which they (sometimes wrongly) believe offer the prospects of delivering simple, uncomplicated services for guaranteed profits. But their narrow focus of interest means that their perhaps surprisingly small total share of the cake has become far more significant than it might appear. Davis, Jacky; Lister, John; Wrigley, David. 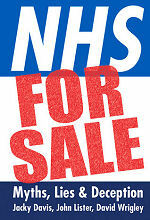 NHS for Sale: Myths, Lies & Deception (Kindle Locations 3992-3999). Merlin Press. Kindle Edition. Take for example the patient wishing to jump the NHS queue for a hip replacement operation. Using his insurance plan, the insurance company would approve the procedure at a higher cost than the NHS tariff and since it's a high-turnover 'standard low-risk' procedure the company minimise any risks and at the same time make a profit. The problem of course is the NHS do not receive the work or profit and losing patients and income to the private sector destablises core NHS services such as A&E. Ultimately, the NHS will only provide the high-risk costly procedures unwanted by the private sector or when they hand patients back to the NHS when something goes wrong. NO WAY NO WAY, IT'S HEALTHCARE FROM THE U.S.A.
Lancashire Teaching Hospitals NHS foundation Trust (LTH Trust) are now more or less run by private consultants in the readying for new U.S. models of care. Chairman of LTH Trust 'Sue Musson' [originally from the USA where healthcare is private] is 'proud' to have been joined at her latest meeting by KPMG Partner, Amanda Latham, who provided a helpful presentation on KPMG’s audit opinion on their financial statements and quality account. Private companies such as KPMG, McKinsey, Deloitte and Price Waterhouse Cooper (PwC) have a controlling influence on bodies regulating the NHS such as NHS Improvement (NHSI) and are also major beneficiaries. If in doubt, take a look at the executive board of NHSI the NHS’s economic regulator. You will see KPMG, McKinsey, Deloitte and PwC have pretty much got the board sown up. CCGs are running the hospitals and pushing NHS England's 'Five year forward view' plans called STP's, which as we know are really American ACO models of private healthcare. Hospital trusts are underfunded but won't get the transformation funding from NHSE until they meet the financial reset, which means more cuts. That's where McKinsey & KPMG come in. Pharmacies are in on it as well, as are the third sector (ACO partners). This term is explicitly used when very controversial and unfair changes are proposed and reaction from opposition needs to be strategically managed on both sides. Not to fear, in step the Chair of the Lancashire hospital Trust 'Sue Musson'. Sue has considerable experience of dealing with 'change management', strategic planning, research and building sustainable partnerships with agencies such as local authorities and universities. She was the Chair of Southport and Ormskirk NHS Foundation Trust before joining Lancashire Teaching Hospitals NHS foundation Trust. Yes, good 'ol U.S. healthcare has hit Warrington in the form of an 'Accountable Care Partnership' (a precursor to an Accountable Care Organisation or 'ACO'), which aims to bring together resources for health and for social care into one place, forging new partnerships and delivering more efficient, value-for-money services. Value for money services, that's where the 'change management' comes in. In this video, dismantling our NHS is shown to be done in 5 steps. All it takes for its completion is for folk to sit by and do nothing. Care Homes or Cash Cows? All this 'Care closer to home' stuff has been the mantra of many successive governments. The prospects for Sustainability and Transformation Partnership Plans (STPs) in shifting substantial amounts of care away from hospitals and long term care relies heavily on the availability of intermediate care services that are tailored to local needs and circumstances. Well, that's the theory anyway. Certainly, the Labour Peer Lord Carter with his 'review' looks at how private care homes and fees can help home the geriatrics blocking up the beds in the local hospital. Lordy dawdy Carter of Coles bagged his first private care home in 1988 and now has a string of them so he's advocating the elderly + the taxpayer pay him & other care home providers to take in the aged from the hospitals. But is that really the problem here in Preston and Chorley? Delayed transfers of Care (DTOC) lead to cancelled procedures and can close a hospitals doors to other patients. If beds are taken up by the elderly who needn't be there then your ambulance could get turned away & redirected elsewhere, as happened 8 days ago at Preston Hospital. 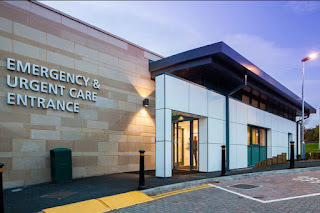 The backlog of patients at Preston was so bad one patient (anon) reported..
"My wife and I accompanied an elderly neighbour to Preston A&E and the corridor outside the unit had a long queue of patients on stretchers, by each stretcher there were two paramedics waiting to handover the patients. This meant that several ambulances were out of action. As the queue got longer a senior paramedic told everyone to put "reverse queueing" into action. When I asked what this meant he said that the stretchers would be moved round the corner so the problem didn't look as bad!" Many elderly patients cannot be discharged from hospital until they've been assessed as being fit to either live alone or in a care home etc. then there's potential rehab and the mobility test and social services need to be involved for financial assessment and to find some sort of suitable care package such as re-ablement. But even if this problem was to be solved, it wouldn't result in more doctors working in Emergency medicine with the Chorley A&E re-opening. But it would go some way to reduce the trusts financial burden which currently runs at a pre-deficit of £34m and a projected deficit even greater. Richard Humphries of the social care institute for Excellence (SCIE) says "the evidence is positive. Intermediate care seems to work for most who receive it". What he means of course is for those who can afford it.